Open offices are a popular option for startups, and the creative or tech industries. Popularized by Facebook and other tech giants in Silicon Valley, these types of offices are characterized by any floor plans that use large, open spaces while minimizing the use of small, enclosed rooms like private offices or cubicles. Some mixed office spaces include a combination of a central open work area, perhaps with rows of desks, and conference rooms or individual break out rooms around the perimeter. Studies show that open offices eliminate physical hierarchies within a company and foster a greater sense of communication, collaboration, and creativity among employees. On the other hand, the downside primarily has to do with the near elimination of spaces for workers to find peace and quiet for meetings, phone calls, or otherwise individual work. 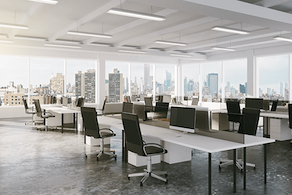 If you’d like to opt for an open office layout, but are concerned about how to minimize the drawbacks of this type of floor pan, here are the top ten workplace efficiencies for open offices. Create a generous remote work policy for employees in an open office plan. Trust that employees will remain just as productive, if not more so, on days that they’d prefer to take reprieve from the usual shared desk space. But with a beautiful open layout, they’ll likely be happy to spend most of their work days at their lovely office. It’s important to carve out areas for employees to find reprieve from an open and potentially noisy office plan. Add conference rooms and smaller individual or break-out session rooms equipped with electronics like smart tvs, projection screens, whiteboards, and conference phones. With these separate areas, employees will better be able to step away and recharge, brainstorm ideation, or meet with coworkers or clients in a non-public space. And don’t forget a large break room, kitchen, game room, or even nooks with comfy lounge chairs and tables. 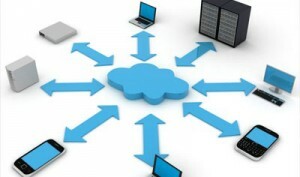 Using less paper and opting for shared online drives, helps reduce office clutter and increase communication. This is essential in an open office when minimizing individual messiness contributes to a sense of communal organization. A lack of walls and minimal private rooms for employees to book for meetings means that companies have gotten creative in alternative communication forms that minimize unnecessary noise. Avoid the temptation to shout at your coworker sitting a few desks away by signing into a professional messaging software like Slack and sending them a private chat. Typically departments and teams are designated separate spaces on different floors of a building or behind various hallways and doors. In an open office space, everyone is accessible and easy to find. Furthering cross-collaboration, employees are more likely to meet and interact with those outside of their immediate teams in an open office. No one likes to work in a dark corner cubicle where the closest window is hidden away behind a manager’s office door. 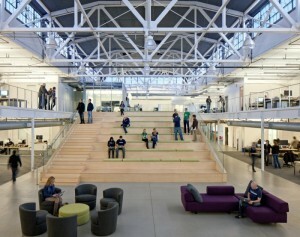 Open office plans focus on creating grand light-filled spaces. Light and airy spaces are not only a serious mood booster, but can help motivate employees who feel as though their work environment was thoughtfully planned. Offices without walls support a greater sense of community. Desk neighbors can chat and become friends. Being able to walk around an open office and say good morning or how are you to coworkers you otherwise wouldn’t see on a day-to-day basis helps build a strong sense of purpose and community at a company. Eliminating physical barriers between higher ups and other employees works to eliminate traditional corporate hierarchies. Picture a CEO’s office right in the midst of an open office plan, with at most clear walls for some noise separation. This CEO immediately presents themself as open and available to their employees. Let’s just hope they adopt an open-door policy, as well. Promoting a sense of transparency is that much easier when the playing field is leveled for all employees. With everyone working in closer, yet open quarters, there will hopefully be no need for office drama or gossip. Rather, employees will feel accountable with this greater transparency, trust, and communication. Open offices allow employees to commingle in a central space. Instead of having workers retreat into individual offices, an open office facilitates increased communication between team members sitting near each other, as well as across departments without the hindrance of off-putting cubicles and walls.